Health eCareers Network, an online single-source healthcare recruiting solution for providers and job seekers recently published their quarter two “Healthcare Jobs Snapshot”, which provides a window into the industry’s current hiring and employment trends. According to the report, employment in the healthcare industry grew at a steady pace last year and will continue to keep pace throughout the rest of 2016. Data was collected from Health eCareers online database of job openings placed by healthcare providers across the U.S between April 1 and June 30 and comprises 64,290 healthcare and medical job openings placed by over 3,000 hospital and healthcare organizations. In this blog, we’ll go over the essential highlights from the report, explain why each matters and how it might affect your organization and the healthcare industry. Despite speculation about the quality of national job growth, the healthcare industry is actively adding jobs. According to the report, “the healthcare industry continued to add jobs to the U.S. economy at a steady pace in Q2. According to the Bureau of Labor Statistics, healthcare employment increases by 44,000 positions in April, 46,000 in May and 39,000 in June.” Additionally, the Bureau of Labor Statistics found that between January 2014 and June 2016, ambulatory healthcare added 572,000 jobs, which accounts for 58 percent of net-gains for the healthcare industry. Moreover, hospitals added over 300,000 jobs during the same period, which accounts for 33 percent of healthcare’s overall employment increase. The largest increases were seen in therapy, allied health, physician/surgeon and nursing specialities. Healthcare is projected to be the fastest growing industry within the service-providing division from 2012-2022, with a 2.6% per year growth rate. Employment is projected to grow by 29% by 2022, according to the Bureau of Labor Statistics. This is 2X faster than overall projected employment growth. 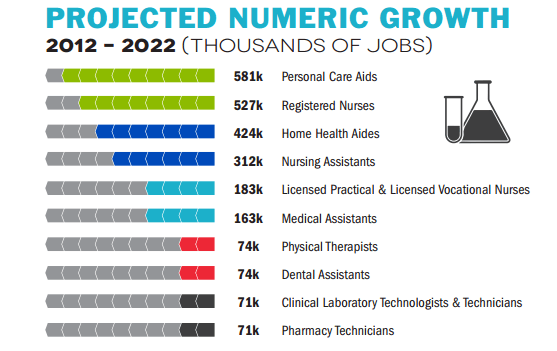 By 2022, the healthcare industry is expected to be the largest employer, overtaking state and local government by number of jobs. 64% of healthcare professionals surveyed plan to seek out a new job within the next year and 40% within the next 3 months alone. There were 30, 450 physician and surgeon related postings in Q2 of 2016, which is 47% of the total job postings.Despite the fact that 16.4 million people are now covered by health insurance either through their employers or through expanded Medicaid coverage under the Patient Protection and Affordable Care Act, it’s become increasingly difficult to secure a personal physician. According to a recent Health eCareers article, the Center for Disease Control found that 31% of physicians nationwide are unwilling to accept Medicaid, in part because Medicaid reimburses a mere 56% percent of what private insurers pay. The result of this practice is that it drives up emergency room usage by insured Americans. According to the report, three quarters of emergency physicians report that the number of visits are going up. When combined, nursing, nurse practitioners and physician assistant positions made up 32% of all Health eCareer job openings in Q2 of 2016. According to the breakdown of job postings, nearly 70% of opportunities went to registered nurses, 15% went to nurse support, 13% went to nurse management and 3% went to nurse management. Nursing assistants, general medical/surgical RN’s, emergency medical RN’s, General LPN / LVN / RPN and psychiatric / mental health RN’s made up the top five nursing positions posted. Within the practice, one of the biggest issues raised by the report is that a new study found 30% internal turnover rates among newly licensed nurses working in hospitals. Previously, studies estimated only a 13% internal turnover rate. When RN’s leave their jobs, it can be costly for hospitals and also affects quality, Organizational costs due to RN turnover vary, but can be as much as $6.4 million for a large acute care hospital. Studies have also shown an association between turnover and an increase in the use of physical restraints, pressure ulcers and patient falls. Along with nursing and physicians/surgeons, there has been a lot of growth in the areas of allied health, therapy and dietetics/nutrition. In fact, U.S. News and World Report ranked both dietician and nutritionist positions 23rd in their list of Best Healthcare Jobs. Typically, this includes professionals that specialize in advising clients and patients about to to eat to lose weight or manage chronic conditions such as heart disease and diabetes. Many of these professionals (30%) are employed by hospitals, while others work in government, nursing and residential care facilities, outpatient care centers, and accommodation and food services. Additionally they may also work in physicians’ offices and schools. The bureau of labor statistics predicts that the profession will grow 16% by 2024, adding 11,000 jobs. This report is great evidence to show that the healthcare industry is constantly changing. Physician/surgeon and nursing jobs continue to account for the greatest percentage of opportunities advertised by employers on Health eCareers, according to the report, while nurse practitioner continued as the third most in demand. Therapy jobs outpaced physician assistant jobs for fourth place. In particular, family medicine, emergency medicine and internal medicine continue to be in high demand, showing significant quarter-over-quarter growth. The affordable care act has had a huge impact on the structure of the industry and has shifted demand in different areas. As implementation continues, it’s likely that we may see additional shifts, many of which may be unpredictable. At Healthcare Recruiters International, we always have our ear to the ground when it comes to the latest hiring and employment trends within the healthcare industry. Be sure to check back for future updates so that you can stay in tune with what’s happening out there. The healthcare sector is set to continue growing. But will there be enough qualified candidates for all the available jobs? $13.4 billion will be spent on healthcare sector recruitment advertisements in 2016. There are currently 478,284 healthcare related job openings. On average, jobs are posted online for 50 days. There are 19 candidates per job opening. There are 12,230,000 healthcare professionals in the qualified talent pool available for healthcare related positions.